Matrox Graphics Inc. has entered a partnership with American Portwell Technology Inc. to launch the Portwell M9020B 4U rackmount system for large-scale video walls. The Portwell M9020B has been jointly validated for use with up to 10 Matrox Mura MPX input/output display wall controller boards to support up to 40 full 1080p HD inputs and up to 40 full 1080p HD outputs from a single system. The Portwell system is designed to enable OEMs and system builders to create high-density video wall solutions for various markets including digital signage, mission critical control rooms, security & surveillance, and large public venues. The Portwell M9020B 4U rackmount system features a 10-slot, PCI Express Gen 2 x16 Portwell backplane to house the Mura MPX PCIe x16 Gen2 boards, with each leveraging 64 Gbit/sec duplex data transfer for Full HD performance. Mura MPX display controller boards are capable of capturing, scaling, positioning, and displaying a variety of input sources—including High-bandwidth Digital Content Protection (HDCP)-compliant devices—across an array of monitors, projectors, cubes, or tiles. The new Portwell system can also host other Mura products such as the Mura MPX-SDI video input/output board, and both the MPX-V16 and MPX-V8 analog capture SKUs for I/O flexibility. 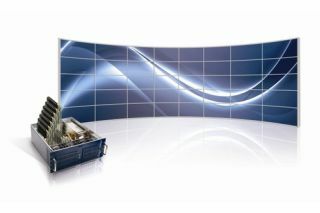 “Matrox sees a tremendous amount of potential with Portwell’s latest video wall solution, as this provides OEMs and system integrators with a low-cost, high-performance value option to build video wall systems,” says Helgi Sigurdsson, Product Manager, Matrox Graphics Inc. “Incorporating Matrox Mura technology promotes the delivery of visually appealing and highly functional installations that will meet any and all customer requirements."